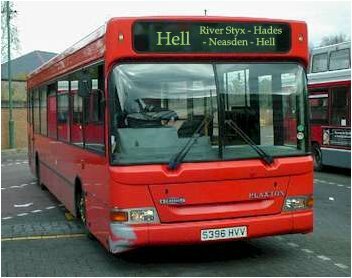 Buses are often the bane of my existence. I would prefer to travel on a vinegar-soaked Penny Farthing than a London bus. Children behave badly on buses. There is a direct correlation between children's behaviour and their subconscious sense of danger. They sense little danger on buses - they are used to travelling by cars and if there is a problem they can just press the emergency exit button and skip out of the bus - and so they behave raucously and make a nuisance of themselves. On trains kids behave a little better, they know that they are trapped between stations and even though they can see the outside world, they can't escape too easily. They sense some danger. On tube trains kids behave very well indeed, they sense that they are trapped underground and are at the whim of the driver until they reach the next station. I don't know what the moral lesson of all this is. I suspect that children need some sense of danger or punishment in order to behave. Carrots are all very well, but sometimes you need a stick. I believe that children should be not seen and not heard.